Greetings in the name of Jesus and thank you for your interest in Prayer 3:20. This prayer campaign is based on Job 42:10 where Job prayed for his friends and God turned his situation around. We know this principle of the reciprocal Blessing of prayer is mentioned throughout the Scripture both in the Old and New Testament. You must be willing to specifically pray for Pastor Stewart and two other people for the twenty days beginning August 8, 2016. You will have the opportunity to enlist in this prayer effort by giving us your name, the names of the three people you are going to pray for. You can place your names in the church prayer box. We will have three people praying for you throughout this prayer campaign. 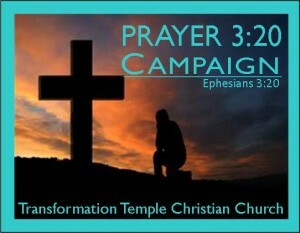 Download the rest of the Prayer 3:20 campaign.